When I'm not thinking about skiing (sorry, these snow dumps in Lake Tahoe, Utah and Colorado are only making my addiction worse because I wish I could plow through the 13-plus-inch powder), I've got marathon on the brain. I have a 26.2 miler to run in 12 days--too close for comfort--so whenever I see the word marathon, I'm there to read more. At least it's a healthy balance between the two, although I'm definitely using the reading to divert my attention away from training and tapering (oops). After the latest report from Vail--19 inches today plus 11 yesterday and comments from skiers about skiing the best day ever--I need all the marathon diversions I can get. But that's easy today because two big name races are making April 7, 2010, a date to remember. 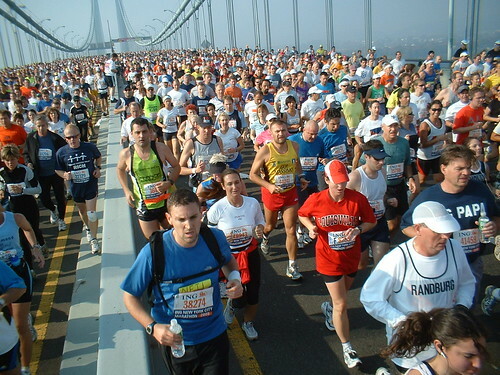 The New York City Marathon holds its lottery while the Marine Corps Marathon opens registration. For the first time ever, the New York Road Runners will launch the 2010 ING New York City Marathon by broadcasting its lottery selection show at noon, eastern time. That's either nerve-wracking or exciting for anyone who's among the record number of applicants vying for a spot. You can watch the show online at www.nyrr.org to see if your name is called, watch the ceremonial selection of eight Marathon lottery winners from around the globe, and learn about the two athletes from the professional field making their mark on the Big Apple. If you miss the broadcast, or have Internet troubles, check www.ingnycmarathon.org to see if your name was selected. To celebrate the lottery, and build excitement about the November 7 race, the NYRR store will be open all week, offering New Yorkers the chance to grab their 2010 training gear. Check out the store at 9 East 89th Street, or visit the online store. And let us know if you're in! Runners love a reason to run, especially when it involves dates and anniversaries. I might be using Chicago as proof, first with registration flooding in 2007 when the race turned 30 and again with its 10-10-10 event day, plus no slow-down in between, but numbers have never been slow for races in the Washington, D.C. area. And the Marine Corps Marathon is no exception. Its registration opens at noon today for the 35th running on October 31. A Halloween run and an anniversary? There's a double whammy that is sure to bring runners fast, especially after the Army 10-miler closed in 30 hours last week. Yesterday, the Bank of America Chicago Marathon announced that Ryan Hall would be sprinting down the streets of Chicago come October. Hall is only days away from running Boston but he's already thinking six months ahead. And he wants to use Chicago's flat and fast course to attempt to lower Khalid Kannouchi's American record. "I have been preparing for an attempt to lower the American record since I ran my first marathon in London in 2007, and there is no other U.S. course that could allow me a better opportunity than Chicago," commented Hall from Boston where he is in final preparation for the Boston Marathon on April 19. "It's remarkably flat and fast with a veteran production team that sets a stage for athletes to produce personal and national records, which is my goal." Read more here. My marathon thoughts wouldn't be complete without a little something related to the Boston Marathon, since that's the race next on my calendar. Even better when it's a story that offers some insight into the race that turns Patriots Day into a New England party, and answers some questions that never crossed my mind until they were answered by a 13-year vet. Check out Bill Simmons' Idiot's Guide to Boston. Photo grabbed from Martineric at flickr.